Google Android users can now access data and mapping capabilities on their smartphones with the ArcGIS for Android application, which lets users find and share maps as well as deploy GIS data and functionality on Android devices. The free app is now available and can be downloaded directly from Android Market. Android users can use the ArcGIS app to quickly find and edit map features. 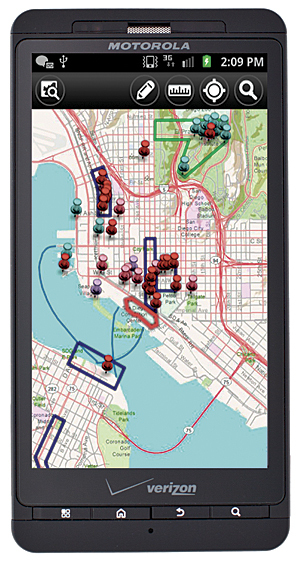 ArcGIS for Android is built on the ArcGIS Runtime Software Developer Kit (SDK). This SDK lets developers create custom, spatially enabled applications for Android devices and is designed to use web services available from ArcGIS. The ArcGIS Runtime SDK for Android is now available for free and can be downloaded from the Esri Resource Center. A native app, ArcGIS for Android serves as a mobile gateway into the ArcGIS system and promotes collaboration and information sharing between users. They can use the app to explore maps, find places and addresses, query information hosted on either ArcGIS Online or ArcGIS for Server, and collect and edit data. As this application is part of the ArcGIS system, existing Esri customers can access and share corporate maps to extend the reach of GIS to Android devices within the enterprise using ArcGIS for Server. Users have the ability to navigate map galleries in just a few taps and search for and identify locations and GIS features. Detailed metadata is included to provide users with additional map information. The ArcGIS for Android application also provides an intuitive data collection and editing experience. The app includes a set of hosted industry-specific collection sample maps so users can test-drive data collection and editing capabilities. The embedded GPS or the map can be used to collect and update data, as well as attach photos, videos, PDFs, and Microsoft Word documents. Popular maps can be accessed faster by adding them to a favorites list. When interacting with the map, users can tap and hold to accurately locate a position on the map using a magnifier. Linear and area measurements can also be performed based on current location or by interacting directly with the map. Display data on an ArcGIS Online basemap. Interactively add graphics and markups to a map. Query features or attributes within GIS data and display the results. Execute a GIS model using ArcGIS for Server and display the results. Developers and Esri Partners can easily build applications that work with their own published web services and use the runtime SDK to create applications that can be deployed within their enterprise or to the public via Android Market. With this release, ArcGIS technology now runs on multiple mobile platforms and devices including iPhone, iPad, Windows Phone, and Android. "The Android smartphone and tablet market has really exploded," says David Cardella, product manager for Esri mobile technologies. "We see these devices increasingly being implemented within organizations that want to extend their enterprise GIS from the office to the field. They want to replace their paper-based workflows and improve the currency and the accuracy of their data—all in an effort to make more timely and accurate decisions." To learn more, visit esri.com/android.